I have decided to embark on a new path. 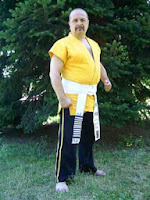 It is with a heavy heart that I will no longer be associated in any way with Isshinryu karate. You read that right. This is no joke, I assure you. In the coming weeks I'll be traveling to Italy to begin my tutelage under the world renowned grandmaster Gilberto Pauciullo. I'm sure you've all heard of him -- who hasn't? Professor Pauciullo holds the distinction of earning more black belts and honorary certificates than anyone in martial arts history. He has attained 10th dan black-belt rankings in twenty-two styles; five in jiu-jitsu, one in mexed [sic] martial arts (MMA from Mexico? ), one in plain ol' self-defense, and others that I have to admit I've never even heard of. Why waste my time with one style when I can have pretty much all of them? I never knew the Police Department had their own martial art, complete with a kyu/dan ranking system. (To say nothing of the Japanese rank of dan being used in Chinese and Vietnamese arts.) Pauciullo also claims 11th duan (?) in something called Man Seer Kung Pai Kung Fu, a style he created in his spare time before he became too busy collecting black belts. 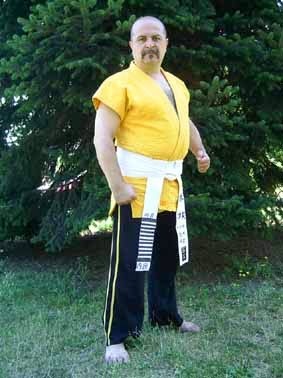 I heard he was invited to enter the UFC but declined because, obviously, the techniques he uses are just too lethal. I have my work cut out for me. When I come back from overseas I'll be describing my training experiences in future posts. Wish me luck!